I guess its time to start thinking about cooling again. It occurred to me that a low tech, but very efficient air conditioner might be put together by combining two items from the Experimental page. Warning -- these are simple test setups just to look at feasibility and performance -- if you are looking for pretty, you won't find it here. The first is the Evapro-Radiative cooler. This is a very simple gadget that runs water from a coolth storage tank over a metal surface at night. The metal surface faces the night sky, and the water is cooled by a combination of radiation to the sky and evaporation. As the little test shows, it is an effective cooler, and the only power consumption is for the small circulation pump (which could be PV powered using a battery). Even with the not very efficient pump I used, the COP was over 12 (SEER 40+). The 2nd item is Nathan's car radiator coolth distribution system. The radiators turn out ot be very effective water to air heat exchangers -- and, cheap to boot. So, the evapro-radiative cooler would cool an insulated water tank at night, and a small pump would be used to circulate the cooled water to the radiators inside the house during the day. The combination of the efficient cooling provided by the evapro-radiative approach and the efficient distribution of coolth by the radiators should make for a very high COP system. With a little bit of PV, it could have a COP of infinity. It should also be a good system for off-grid homes. The system does not remove humidity, which would be a problem in some climates. I guess its possible that some water would condense on the radiator coils and could be collected and drained for a bit of humidity removal. 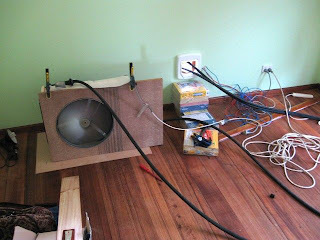 I am building this right now at my house.. Only i am going to put a radiator/coil in my duct. I'll have to check out that cooling system, i am currently evaluating how best to cool the water at night. Hi -- Would like to hear what you choose, and how it works out. 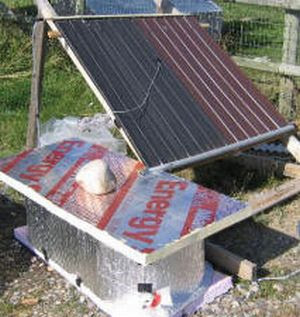 I have been shopping to buy affordable PV system and can't believe what I saw on www.sunelec.com. These guys definitely have the best prices in USA. I saw panels as low as $0.98 a watt. It is nice to build from scratch but you gotta look at the time you put in and pricing on the panels. Check it out. I even found 225 Ah batteries for $ 90.00 it is hard to find these prices when you are a home owner. Got any DIY Pool Heating Ideas? Projects?